I am now brushing on 60 years old and still going strong. Despite the enormous punishment they have suffered, my legs appear to be as good as they were 40 years ago. Thank goodness for that! I attribute this very much to my barefoot childhood which has endowed me with strong feet. 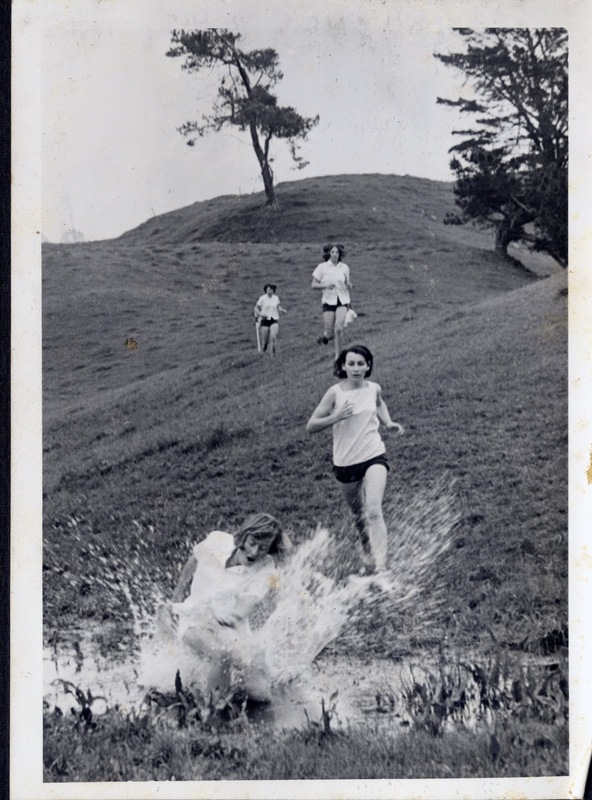 My strong feet come from a barefoot childhood in rural Putaruru, walking and running free over rough paddocks and gravel pavements. As much as I could, the barefoot tradition has been continued with the next generation of Mollers; but it has not been so easy. Children running about barefoot, especially during winter, is frowned upon nowadays. I could not tell you how many times a mother has grasped the feet of one of my barefoot buggy-bound children and exclaimed "Oh, you poor wee thing; your feet are so cold!" bent and shortened toes and weak arches. Going barefoot, as a child, allows the feet, including the toes, to grow to their natural length and width without restriction. The ligaments, tendons, muscles, bones and joints respond to bare foot walking and running on natural surfaces by growing stronger and more resilient. The skin and gristle of the foot pad thickens and hardens, giving a foot that is resistant to blistering and bruising. These adaptations to barefoot use are hugely beneficial for the adult when embarking on a fitness challenge such as the Oxfam 100km. Do what I did: I cut the ends out of all of our babies "stretch and grow" stockings. If socks were ever worn, I ensured they were oversize and loose so as not to cramp the toes and shoes were never tight. I ensured that bedding did not compress their tiny toes. Always. Including when out in the yard. 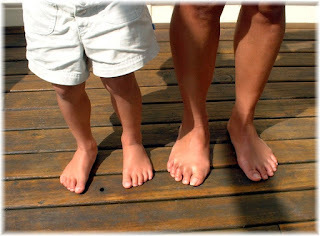 Holidays are a wonderful opportunity to run about barefoot and harden the feet. As the skin hardens, those annoying prickles become less of an issue. The beach is the perfect place for barefoot activities. mile race - Bare foot, of course! Good luck with this one! But please try. Okay, most schools I know of have more or less banned barefoot in the playground for ridiculous health and safety reasons such as a life-threatening stubbed toe. Part of the problem is that even so much as a grazed knee must be reported and the parents advised. It boils down to being a whole lot of administrative fuss and bother that schools would rather be without. But why can't children take their shoes off while in the class room? The excuse for not allowing or encouraging such a practice is that the smell will be overwhelming and, besides, all those shoes lying around are a safety hazard and children will be forever misplacing them. I know these are feeble excuses; but this is the way things are going - administrative expedience before health. Resist! It is easier nowadays to just let things be and have your children grow up without ever getting mud and sand between their toes. But please be persistent and strong. Your children will thank your for your trouble - eventually!